Only two comics for me this week! I still need to read the second and third issues of Uncanny X-Men, but I plan on getting to those later today (still trying to catch up on everything after our trip). I did have a chance to read Firefly, and it was amazing! West Coast Avengers is still an enjoyable read, but I want to know why Gwenpool's powers aren't working! Normally, she can control where she is within a comic (because she can break the fourth wall like Deadpool), but her abilities seem to be nonexistent at the moment. She tried to use them in a previous issue and almost died when they didn't work. Synopsis (via Goodreads): On one terrible night, 17-year-old Harley Langston’s life changes forever. At a party she discovers her younger sister, Audrey, hooking up with her boyfriend, Mike—and she abandons them both in a rage. When Mike drunkenly attempts to drive Audrey home, he crashes and Audrey ends up in a coma. Now Harley is left with guilt, grief, pain and the undeniable truth that her ex-boyfriend (who is relatively unscathed) has a drinking problem. So it’s a surprise that she finds herself reconnecting with Raf, a neighbor and childhood friend who’s recently out of rehab and still wrestling with his own demons. At first Harley doesn’t want to get too close to him. But as Audrey awakens and slowly recovers, Raf starts to show Harley a path forward that she never would have believed possible—one guided by honesty, forgiveness, and redemption. The Art of Losing sounds like it's going to be an emotional read, and the reviews look really positive! I'm sure Harley is experiencing a lot of conflicting emotions -- love, betrayal, guilt, hate -- and it'll be interesting to see how she deals with them. I have been hearing good things about this book. Heartbreaking, but hopeful, which is a combination I love. I am pretty hyped to read it. Same! I love books that break my heart and put it back together again! <3 I already have high expectations for this one. I hope we both enjoy it! I forgot that Lizzie Mason wrote a book, I hope it is good! This is the first time I've heard of the author! What else has she done? The Art of Losing does sound really emotional, and I like the style of the cover. I love how simple the cover is! It almost looks like finger-paint! I always wonder if designers make things like this by hand, or if there's already a font/format available. Ooh this does sound like an intense one. I'm glad the early reviews are good. The Art of Losing sounds like such an emotional read. I can't imagine all the feelings that situation would create. I believe it has something to do with Madame Masque, which is exciting! I think this series will pick up some of the threads from All-New Hawkeye, so we might finally learn what happened to Kate's mom. The Art of Losing sounds like it'd be a hard read... I'm such a coward lately when it comes to books I know will put me through the wringer! I love that the WCA'ers are doing bumper cars? That comic looks fun. 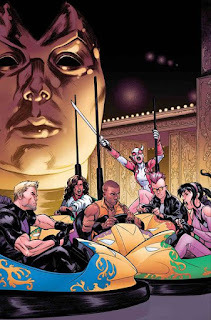 And is that Madame Masque in the background of the cover? It looks like her kinda. 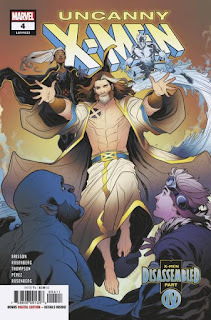 I'm really curious about that new Uncanny X-Men since I haven't read them in a while, and they've gotten so far away from the team that I knew, but it looks like maybe they're going back that way. I've been reading mostly trade paperbacks of older stuff, since I want to review some of it, and I'm still mostly liking Scooby Apocalypse. I'm thinking of trying Vampironica too which I just discovered, and I gotta get Domino Vol. 1 one of these days. It is Madame Masque! I hope that means we learn more about Kate's mom. All-New Hawkeye ended before that thread was really addressed. The new Uncanny X-Men has been great so far! There have been a lot of unexpected twists, and now that Legion is involved... The ending of the latest issue was crazy. I'm not sure what the original team looked like, but this seems to be a good group. There are a few X-Men that I'm not familiar with, but I'm catching on. There's also a team of students that are training to become X-Men, so they're new as well. I love Madame Masque! Now I want that series even more haha! Is she related to the Kate's mom story at all? I'll definitely be checking out some X-Men. The last storylines I really read were the All New X-Men, where the young original ones came forward in time (I guess they've gone back now?). That story started out well but got kinda iffy towards the end of the run. Scooby Apoc is fun, I'm on the second TP and just bought the third. West Coast Avengers and Domino are at the top of my list for Marvel stuff to try, and the new Defenders stuff has me curious- I was intrigued by the new Namor comic, but after looking at a review I'm not sure. Marvel's so hit or miss right now. There was a shadow in the last issue that I THINK was Kate's mom, so I really hope they address all of that in this new series. She still seems to be with Madame Masque for whatever reason. I don't know anything about the X-Men coming forward in time... I guess I missed that! Everything seems to be normal, or as normal as it gets with the X-Men. We also see glimpses of the Avengers doing different things while they try to save the world. It's been great so far! I almost got the new Namor comic, but declined. It just didn't seem all that appealing, and I get my Namor fix from X-Men Red! 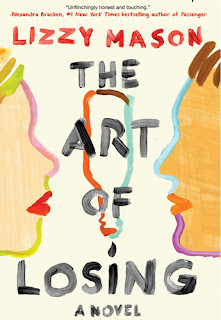 This is the first I've heard of The Art of Losing, but it sounds like a really heartbreaking, yet hopeful read. Hope you end up enjoying it! Thanks! I'm sure this one is going to be an emotional read, but I'm looking forward to seeing how the main character handles the onslaught of thoughts and feelings. I can only imagine how conflicted she must feel!